The Aries PC/104-Plus single board computer (SBC) from Diamond Systems uses the Intel ìBay Trailî E3800-series processor ñ a choice of the quad-core E3845 @ 1.91 GHz or the dual-core E3826 1.46 GHz processor ñ for applications needing high performance and low power consumption. The fully-rectangular Aries board, says the company, gives designers more PCB area and ìcoastlineî to support the multiple I/O options. The SBC is designed to support a broad range of system I/O, including four multiprotocol serial ports, three USB ports, two 10/100/1000 Ethernet ports, and one SATA port. 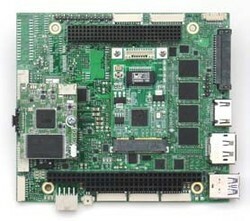 The SBC also supports the installation of a SATA disk-on-module (DOM) with a mounting hole for increased ruggedness. A jumper provides power directly to the module through the single SATA connector, with no separate power cable required. Both the SATA DOM and PCIe MiniCard sockets can be used simultaneously, which gives users a compact embedded computing solution only a ìsingle boardî high. The LVDS connection is dual-channel 24-bit, with the maximum resolution of VGA, LVDS, and DisplayPort at 2,560 by 1,600; maximum resolution for HDMI is 1,920 by 1,080. The boardís LCD power is jumper-selectable between 3.3 V and 5 V, with backlight power jumper-selectable between 5 V and 12 V.